Many business leaders struggle to create a sales forecast that provides an accurate depiction of reality, but reasonably accurate forecasts are an attainable goal for any type of company. Furthermore, they have important ramifications that relate to the core goals of every business, namely growth and profit. One such benefit, backed by research, is that even a modest improvement in forecast accuracy can yield an increase in gross profit margin. With the potential of higher profits on the table, no business owner should be content with a sales forecasting strategy that under-delivers. The road to a more prosperous future runs through forecasts that are reliable and effective, and identify process gaps in pursuit of continual improvement. 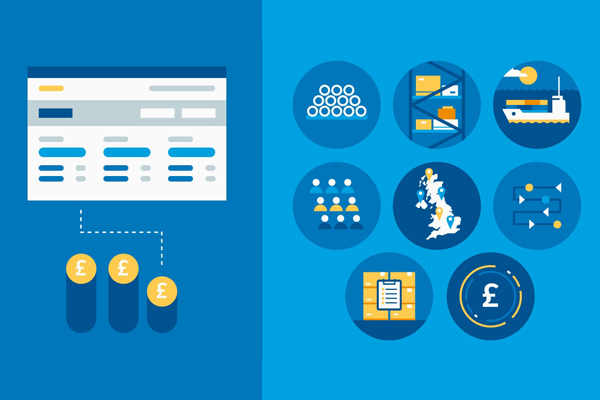 What is sales forecasting, and what does accurate forecasting mean for SMEs? Forecasting plays an important role in numerous functions throughout the business, including resource allocation, supply chain management, cost of sales, sales strategy, and more. This means that it has vital implications for the ROI of the organisation. Research from the Gartner Group found that improved forecasting led to tangible achievements, such as a 15% reduction in inventory and a 2% increase in revenue. For many SMEs, where resources are limited and cash flow is king, these improvements represent a significant boon to the future prospects of the company. Collaboration is an integral element that is missing in the forecasting processes employed by so many SMEs. A well-executed forecast analyses data from many functions of the company in order to make an informed statement about future projections. Therefore, representatives from each department within an organisation should be involved in the process. You’ll have representatives at the table who understand different sets of data on an expert level, and they can contribute analysis that a sales professional may miss. Relying too heavily on a single data stream interpreted by one person may lead to distorted results, and having a collaborative process builds a safeguard against distortion directly into your core strategy. Teamwork facilitates buy-in, which is essential if you expect your forecasts to have an effect on company performance or strategy. When multiple factions know that their contributions matter and feel like they’re a part of the process, they are more likely to accept and champion the results, as well as use them to inform the direction of their departments going forward. Accurate forecasting requires maintaining a balance. You need to use past results to inform future decisions, but able to adapt enough to make adjustments when evidence indicates they are necessary. Analysing past performance data in terms of the present is the bedrock of an accurate sales forecast. Simultaneously, business realities, such as customer circumstances or industry developments, can change drastically in an instant, rendering previous assumptions included in the forecast moot. Whether you forecast once a year or once a month, you still have to be prepared to adapt at a moment’s notice. It’s imperative to have real-time data during your regular forecasting meetings. Your forecast is still going to be outdated by the time you meet for the following review — it’s the nature of the beast — but at least you’ll be making critical decisions every time using the most recent information that is available. Avoid information overload paralysis by scheduling regular forecasting sessions. Set aside time for the forecasting process and confine all activities related to it accordingly. After all, it is possible to become too consumed with forecasting, wherein you constantly feel the need to analyse how new information affects your numbers. This can turn useful points of data into a jumble of numbers with no clear through line. You can meet as often as you feel it is appropriate (monthly, or at least quarterly, is recommended), but the important thing is that the meetings are regular and reserved solely for activities related to forecasting. A key component of effective forecasting is knowing how often your sales process yields feasible opportunities. If you include projections from sales situations that don’t present a valid opportunity for your marketing and sales teams, you’re handicapping your organisation by asking them to create revenue out of thin air. 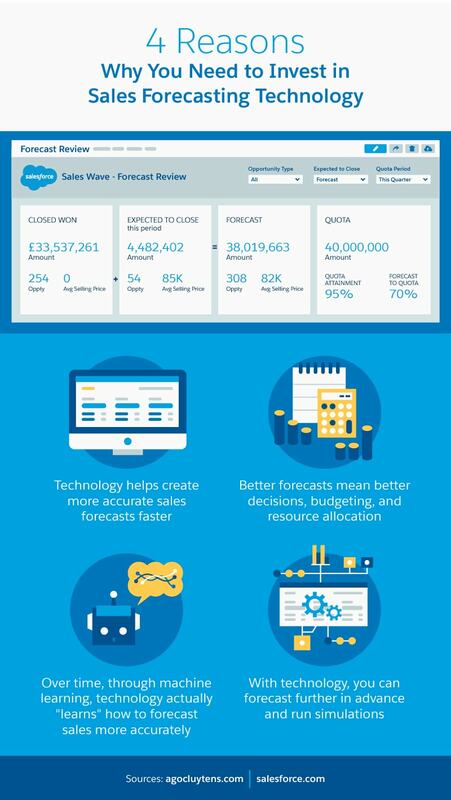 The best forecasters examine each opportunity that will potentially be included in the projections and ask themselves, “Is this truly an opportunity?” In other words, when viewed through the lens of your organisation’s sales process, is there a logical next step for the prospect to take that warrants including this data point in your forecast? It’s vital that this concept is consistently applied across every potential data point according to your specific definitions and processes. Leaders who excel at forecasting are data hard-liners in this respect; they don’t let conjecture disrupt their methods. In addition to scrutinising the efficacy of individual data points, you must have a clear and evolving view of your organisational trends and whether they are expected to continue in the coming quarters and years. Observing high-level trends is difficult when sorting through data manually, as new data sets can push others out of your mind and inhibit pattern recognition. Thankfully, you don’t have to rely on manual processes: Sales forecasting software that is integrated with your other sales acceleration technology can help you see the forest for the trees. When trends are laid bare in front of your forecasting team and backed up by a robust collection of data points, they tell a powerful story about your performance and are impossible to ignore. The benefits of collaboration when it comes to forecasting are manifest, but there's a hidden danger inherent in collaboration. When multiple functions come together to forecast, each business unit likely has a specific goal in mind that their data is designed to represent. Savvy leaders know that no single set of data is incontrovertible when it comes to the organisation as a whole. Protect your organisation against the specter of inherent bias by using a variety of different data sets and points of view. It’s important to have everyone involved throughout the process, but it’s the responsibility of the company’s leader to manage these potentially conflicting data sets and steer the group toward a forecast that maximises value for the organisation as a whole. With quantitative, accurate information, your forecast can steer your company through its decision-making process and help its leaders see a clear picture of its performance. Instead of brushing your incorrect projections under the rug, use them to constantly refine your methods and improve your accuracy for future efforts. Remember that a forecast is simply an aggregation of historical data paired with assumptions about future business conditions and strategic goals. Sales data, meanwhile, is the effect of actual organisational mechanisms on buyer behaviour. By analysing where these two concepts diverge you can get the most value out of your forecasting initiative. Forecasts aren’t meant to be perfect predictors of the company’s fortunes: They’re tools used to inform high-level strategic decisions. Since a sales forecast ideally attempts to identify when, where, and how your customers buy your product, it makes sense that understanding customer segments and buyer behaviour is an important part of forecasting accurately. You can manipulate your forecasts to say whatever you want, but your revenue numbers only move when your customers make very specific decisions and take action. By learning what drives customers to take action at various touchpoints in their purchasing journey, you can create a forecast that paints an accurate picture of that journey in specific terms and mold the customer personas your sales and marketing teams rely on. Smart sales leaders recognise that forecasting and strategy are related, yet independent of one another. Having a well-executed sales strategy can give you important insights into your forecasting efforts, and accurate forecasts can help you make wise decisions about improving your strategy. It’s also important to note that a great forecast doesn’t automatically precipitate a sound sales strategy, and vice versa. As you refine your forecasts and take note of gaps and successes, use these results to alter specific components of your sales strategy, but always remember that a sales strategy exists to move customers through the pipeline and deliver value.